My piece is called Hive. Hive is an installation created in 2012. It’s made from LED tubes, custom software, electrical hardware, aluminum, and stainless steel. It is a ceiling mounted LED light installation that takes the form of a honeycomb that fills up the space, marking the new transfer point connecting the IRT and IND subway lines. The colors move all throughout the sculpture, outlining the hexagonal shape all in a specific path that reminds you of the game John Conway created. Sometimes they’re all the same, and sometimes they’re completely different colors. He creates an experience for commuters through the changing pattern that are presented in such a randomized progression. The most interesting piece of the work to me is what Leo was inspired by in order to create this piece of work. He was inspired by a mathematician named John Conway, the creator of the computer game called Game of Life. ( https://bitstorm.org/gameoflife/ ) In Leo’s work, each outline of the hexagon always changes. To some people, especially to me, this artwork is more of a design, rather than a piece of art with a literal meaning behind it. The artwork explores an audience’s compulsion to recognize patterns and how your brain has a desire to understand and make meaning to a specific piece of art. Leo Villareal is an American artist currently working and living in New York. 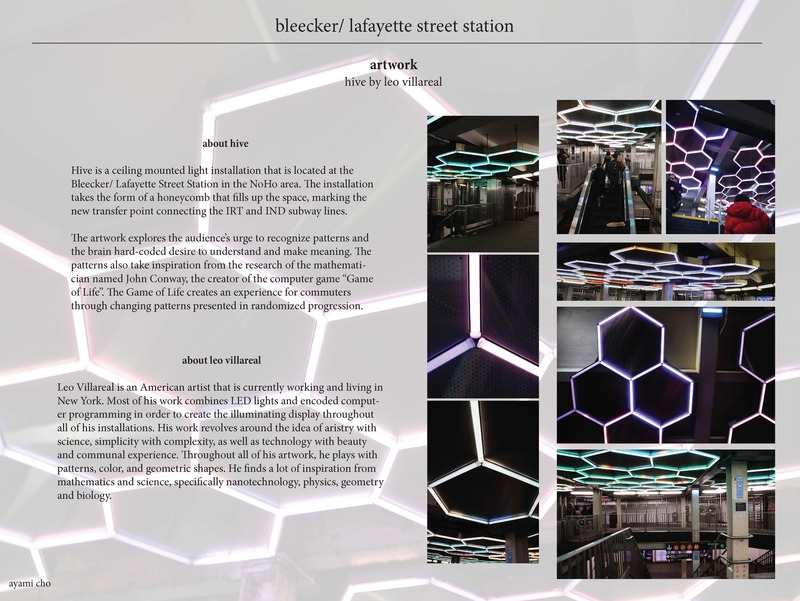 Almost all of his work combines LED lights and encoded programming in order to create the illuminating display throughout his installations. His work revolves around the idea of artistry with science, simplicity with complexity, as well as technology with beauty and communal experience. His artwork plays with patterns, colors, and geometric shapes. He finds a lot of inspiration from mathematics and science, specifically nanotechnology, physics, geometry, and biology. He has a lot of work throughout the US. He created an installation in San Francisco called Bay Lights and the installation was throughout the whole bridge. He had another installation in Madison Square Park in 2013 called BUCKYBALL. IT was extremely similar to HIVE except it was a huge hexagonal ball. A lot of his work connect with each other in some way and he has a very distinct way in working.